Manuscript Group 121, John Strohm Papers, General Correspondence, 1816-1874, (3 boxes) Series #121m.1. 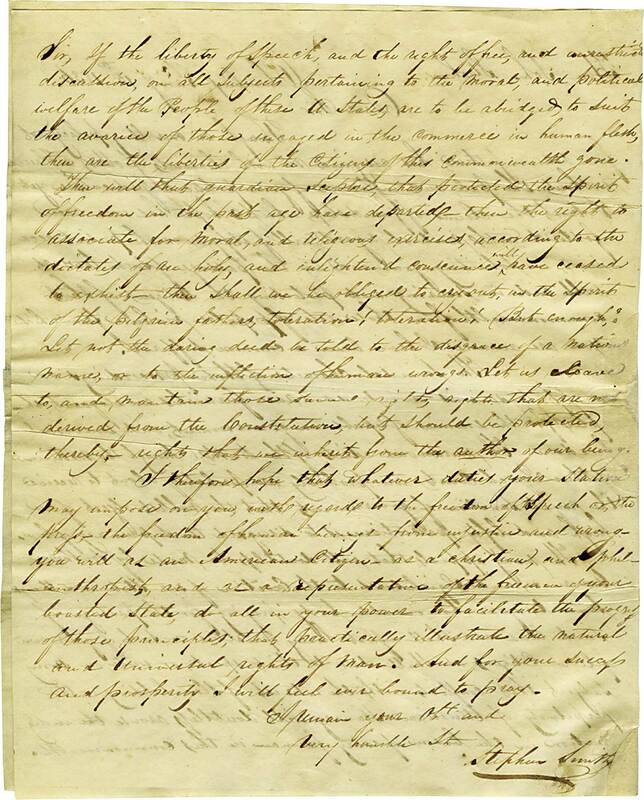 The John Strohm Papers, 1816–1874, Manuscript Group 121, held by the Pennsylvania State Archives, contains the correspondence of John Strohm (1793–1884), a Lancaster County Whig who served in the Pennsylvania House of Representatives from 1831 to 1833, was a state senator from 1834 to 1842, and served two terms in Congress, from 1845 to 1849. 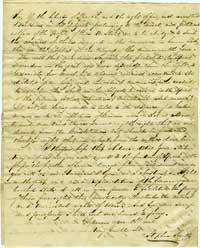 Among this correspondence is a letter written by African American businessman Stephen Smith (circa 1795–1873), dated January 15, 1836, reminding Senator Strohm of recent riots that had occurred over three nights in August 1834 at Columbia, Lancaster County. During the unrest, a mob of white men drove African American residents from their homes into the surrounding countryside. On August 23, 1834, a group of white working men in Columbia demanded that African American property owners living in the community sell all of their holdings and a second wave of riots - reported in the Columbia Spy on October 4, 1834 - destroyed Smith's Front Street office. All eight white men arrested and charged in the rioting were subsequently acquitted. 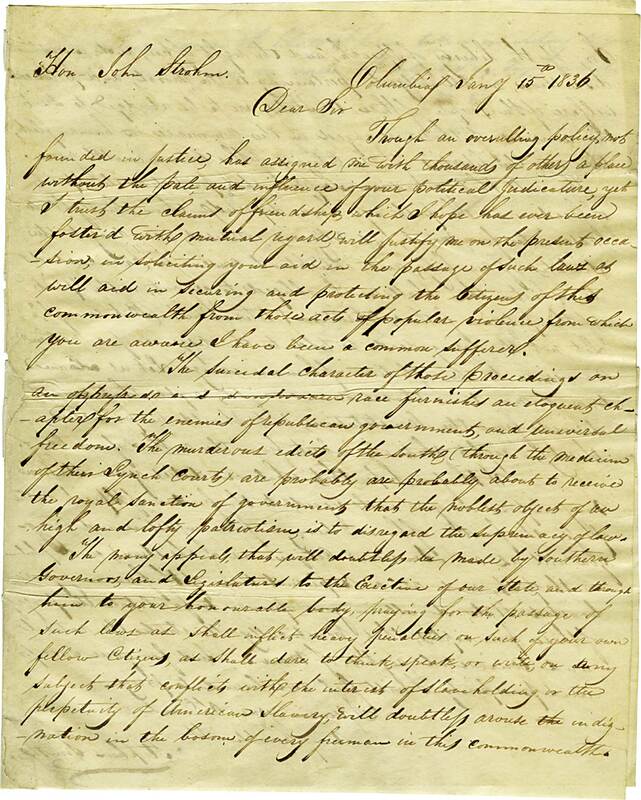 In his letter, Smith asked Strohm to use his influence to protect the rights of free Blacks in Pennsylvania at a time when their right to vote was coming under increasing attack. Despite Smith’s efforts, Black voters were disenfranchised when the words "white freeman" were inserted into the voting clause of Pennsylvania’s new constitution that took effect on October 9, 1838. A former slave of a Revolutionary War officer and congressman Brevet Major Thomas Boude (1752-1822), of Columbia, Smith purchased his freedom in 1816 and established himself in the lumber business. By 1833, he had acquired considerable real estate holdings in Columbia and was, by far, the wealthiest of the community’s thirty-five Black property owners at the time. In 1842, he expanded his business holdings to Philadelphia, placing William Whipper (1804-1876) in charge of his Columbia operations. By 1849, the firm of Smith and Whipper owned twenty-two rail cars that transported thousands of tons of coal and 2.25 million board feet of lumber annually. The partners owned large tracts of land in Canada and Pennsylvania, a steamship on Lake Erie, and lumberyards. Smith also owned fifty-two brick houses in Philadelphia. Upon his death in 1873, he left the greater portion of his estate to the Home for Aged and Infirm Colored Persons and the Zion Mission, both in Philadelphia, and African American churches in Chester, Delaware County, and Cape May, New Jersey, where he owned a summer house. Though an overwhelming policy, not founded in justice, has assigned one with thousands of others a place without the pale, and influence of your political justicature, (sic) yet I trust the claim of friendship, which I hope has ever been fostered with mutual regard, will justify me on the present occasion, in soliciting your aid in the passage of such laws as will aid in securing and protecting the citizens of this Commonwealth from those acts of popular violence from which you are aware I have been a common sufferer. The suicidal character of those proceedings on an oppressed and downtrodden race furnished an eloquent chapter for the enemies of republican government, and universal freedom. The murderous edicts of the South, through the medium of the Lynch Courts, are probably about to receive the royal sanction of government that the noblest objects of an (sic) high and lofty patriotism is to disregard the supremacy of law. The many appeals that will doubtless be made by Southern Governors and legislatures to the Executive of our state, and through him, to your honourable (sic) body, praying for the passage of such laws as shall inflict heavy penalties on such of your own fellow Citizens as shall dare to think, speak, or write on any subject that conflicts with the interests of slave holding or the perpetuity of American Slavery, will doubtless arouse indignation in the bosom of every freeman in the Commonwealth. Sir, if the liberty of Speech, and the rights of free and unrestricted discussion on all subjects pertaining to the moral and political welfare of the People of this state are to be abridged to suit the avarice of those engaged in the commerce in human flesh, then are the liberties of the Citizens of this Commonwealth gone. Thus will that guardian departed that provided the Spirit of freedom in the past all Laws departed -- then the right to associate for moral and religious exercises, according to the dictates of all holy and enlightened conscience will have ceased to exist - then shall we be obliged to cry out in the spirit of the pilgrim fathers' Toleration! Toleration! But enough: Let not the daring deed be told to the disgrace of a national banner as to the infliction of human wrongs. Let us cleave to, and maintain those sacred rights that are not derived from the Constitution, but should be protected thereby; Rights that we inherit from the Author of our being. I therefore hope that whatever duties your States may impose on you, with regard to the freedom of such Speech, or to press for the freedom of human beings from injustice and wrongs you will as an American Citizen - as a Christian, and a philosopher, and as a representative of the freeman of your boasted State do all in your power to facilitate the progress of those principles that practically illustrate the natural and universal rights of man. And for your success and prosperity I will feel ever bound to pray. P.S. 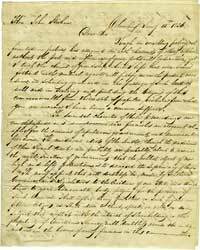 Please excuse the liberty I have taken in writing to you on this occasion, you are aware the subject [is one in which] I am deeply interested.